When people ask me what type of food I like to cook, saucy French foods is my usual reply, but I worry that this gives the wrong impression. Our weeknight meals usually involve a protein with a sauce, but they’re far from fancy. 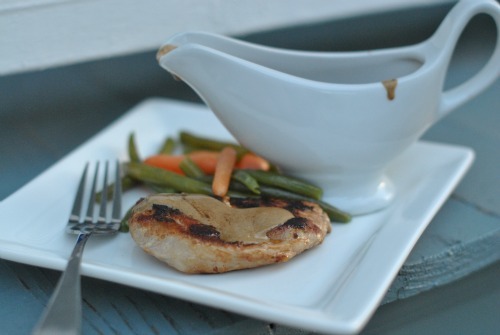 Whipping up a little sauce to top boring pork chops is just part of the dinner routine. Steve, Bella and the baby love the sauces, Jack prefers his meat plain, and Juju likes both sauce and ketchup. Sauce is just part of dinner, take it or leave it, but make sure you have plenty of vegetables on your plate. 1) In a regular skillet (not non-stick), melt a tablespoon of your favorite cooking fat: vegetable oil or butter. Get your pan hot! Add your meat and brown it on both sides before cooking it to your liking. 2) While the meat is cooking, prepare the ingredients you want in your sauce. You’ll need 1/2 cup of some sort of liquid (chicken stock, water, or heavy cream), some sort of aromatic (spices, mustard, or vinegar), and if you’d like, a tablespoon of butter to finish the sauce with a good texture. 3) Remove the meat from the pan and turn up the heat. 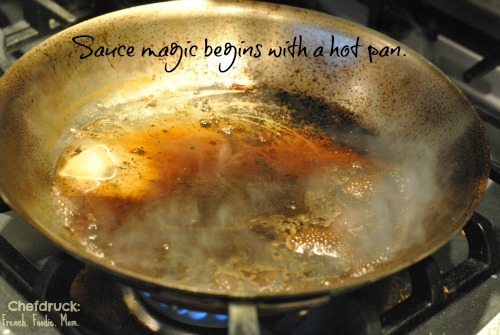 When the pan is nice and hot, and you can see the heat shimmering in the air above, toss in the liquid. With a wooden spoon, vigorously scrape up the brown bits at the bottom of the pan and mix it with the liquid. If the liquid boils away too fast, add another 1/2 cup. Bring it to a boil for less than a minute to combine. Now add your aromatic and stir it in well with your wooden spoon. Reduce the heat to medium and simmer for a minute or two to let the flavors blend in. 4) Take off the heat and finish with the tablespoon of butter that you swirl in, just to bring the textures together. Serve warm either on top or on the side of your meat. If the recipe above sounds maddeningly vague, it’s because it’s meant to be flexible. Adapt it to your mood, to the leftovers in your fridge. Get creative. With pork, I like my aromatic to be a tablespoon of good quality mustard. I’ll share that recipe below. I’ve also had amazing sauce on chicken breasts by folding in a few tablespoons of balsamic and the juice of a lemon. My sauces are mad creations, done in the heat of the moment, inspiration whispering in my ear. Like dreams upon waking, if I don’t write them down immediately, they vanish into thin air, never to be duplicated exactly. There’s magic in sauces. Get creative. You’ll be glad you did. Take the pork medallions out of the fridge and bring them to room temperature. Having the meat not be too cold helps it cook better. Heat a large skillet on medium high heat. Melt a tablespoon of butter in the pan and swirl to coat evenly. Turn the heat to high and add the pork medallions. Cook on one side til nicely browned, about 4 minutes. Flip and brown the other side for another 5 minutes. You want the pork to be done to medium - still juicy inside. Remove from the pan and set aside on a plate covered with aluminum foil. Turn the heat to high under the pan. When you can feel the heat by setting your hand 10 inches above the pan, you're ready to make your sauce. With a wooden spoon ready in your left hand, pour the heavy cream into the pan. Stirring vigorously with the wooden spoon, scrape up all the browned bits at the bottom of the pan. Now add the mustard and stir vigorously again to incorporate throughout. Lower the heat to medium and add the chicken stock. Stir again and bring to a boil. Let it reduce for 2 to 3 minutes. Taste your sauce now. Add salt if you think it needs it. Serve immediately. Awesome! What a great weeknight dinner. Creamy mustard sauces always remind me of home cooked French meals. “With a wooden spoon, vigorously scrape up the brown bits at the bottom of the pan” <– my favorite part of sauce making!